“The Low Emission Zone (LEZ) is much needed since London needs to more than halve air pollution in its busiest streets within four years to meet health standards and comply with air quality laws. However, as currently planned, the LEZ will make a modest contribution only to the necessary reductions in air pollution levels. London needs to reduce the most hazardous vehicle emissions much further, much faster by tightening the LEZ in the most polluted areas of London. It is unacceptable that the Department for Transport still does not have an holistic strategy for the abatement of emissions from older vehicles. Emissions from diesel engines are a particular problem in London” said Simon Birkett, Principal Contact for the Campaign for Clean Air in London (CCAL). Air pollution in many of London’s busiest streets is well over twice the maximum level recommended by the World Health Organisation (WHO) and required by European Union (EU) law, since 1999, to be met by January 2005 (for particulate matter i.e. PM10) and January 2010 (for nitrogen dioxide i.e. NO2). Worse still, there is no sign yet of the UK complying with current or prospective air quality laws by 2010, 2015 or 2020. For example, overall air pollution in Brompton Road is currently at the highest levels recorded since regular monitoring began here. According to the excellent London Air Quality Network (www.londonair.org.uk), annual mean levels of NO2 in 2007 were 93 μg/m3 (micrograms per cubic metre) (at just under the previous peak of 95 μg/m3 in 2006 and the lowest level of 83 μg/m3 when regular monitoring began in 2001). Much worse though, hourly maximum recommended exposure levels for NO2 were exceeded on 437 occasions in 2007 (9% more frequently than the previous peak of 401 exceedances in 2006 and compared with (again) the lowest recorded of 97 exceedances when monitoring began in 2001). In 2007, Marylebone Road experienced average annual NO2 of 99 μg/m3 and 368 exceedances of the hourly standard. These compare with the maximum levels recommended by the WHO and the level to be met under European Union (EU) air quality laws of 40 μg/m3 and 18 exceedances in a whole year respectively. NO2 is the only regulated air pollutant monitored in Brompton Road whereas a full spectrum of air pollutants is monitored in Marylebone Road. NO2 is broadly correlated with PM10 although the latter is increased by high levels of diesel powered vehicle use (predominantly trucks and commercial vehicles). This means that, even though PM10 is not monitored in Brompton Road, high NO2 levels that are monitored there indicate that PM10 is also likely to be very high there. The Department for Environment, Food and Rural Affairs (Defra) has stated that all the exceedances of EU limit values in 2005 were due to emissions from traffic and that additional measures would be needed to ensure that air quality laws would be met by the compliance date. The UK has less than two years to comply with the EU air quality legal standards for NO2. Furthermore, any time extension beyond January 2010 to January 2015 (as an absolute backstop date) would require the Government to demonstrate, inter alia, that all applicable measures have been taken to improve air pollution. CCAL has seen no evidence yet that such efforts have been made and has written to the European Commission saying so. Polling shows that 72% of Londoners are worried about pollution from traffic exhaust fumes according to Transport for London. “We acknowledge the deadly dangers of PM10 but NO2 is the other most dangerous air pollutant facing Londoners. Furthermore, one of the main reasons that strict legal standards are set for NO2 air pollution is that, apart from its own toxic properties, it is a proxy for many other dangerous air pollutants that occur with it – i.e. the so-called nitrogen oxides (NOx) that are generated by traffic fumes. NO2 is particularly dangerous for the old and the young. “Of these, Ground Level Ozone (Smog) is formed when NOx and volatile organic compounds react in the presence of sunlight. Children, people with lung diseases such as asthma and people who work or exercise outside are susceptible to adverse effects such as damage to lung tissue and reduction in lung function. Particles are created when NOx reacts with ammonia, moisture and other compounds to form nitric acid and related particles. Human health concerns include effects on breathing and the respiratory system, damage to lung tissue and premature death. Toxic Chemicals are created in the air when NOx reacts readily with common organic chemicals and even ozone to form a wide variety of toxic products, some of which may cause biological mutations (examples include the nitrate radical, nitroarenes and nitrosamines). “We were concerned to read in the consultation’s Environment Report (in paragraph 7.7.2 on page 54) that “The only potential negative air quality impact of the LEZ would be an increase in the proportion of primary NO2 emissions. The precise reasons are not fully understood but it is thought to be linked to the greater number of diesel-engined vehicles and the fitting of some types of particulate traps that generate NO2 as part of the cleaning process”. There is no excuse for creating the impression that this is a new problem or implying that it might be an excuse for failing to meet air pollution objectives: this effect was clearly anticipated by experts acting for the Department of Environment, Food and Rural Affairs (Defra) by 19 May 2003 when it was referred to in a draft Air Quality Expert Group (AQEG) report. In a letter of 29 October 2004, addressed to the President of the International Olympic Committee (IOC), the Mayor of London provided guarantees in support of London’s bid to host the Olympic Games and Paralympic Games in 2012. “I believe London has the capacity and ambition to deliver the best Games ever for athletes, for sustainability and the environment, for lovers of sport in the UK and beyond.” On the back of these and many other representations, the IOC awarded London the 2012 Olympic and Paralympic Games in July 2005. Details of this letter were sent to CCAL by the Greater London Authority in response to a Freedom of Information Request. Mayor Livingstone went further and wrote “…the Greater London Authority understands that all representations… shall be binding on the city”. Mayor Livingstone’s representation and accompanying environmental and other guarantees from London to the IOC were supported formally by legal undertakings to the IOC from the Prime Minister (9.11.2004), Tessa Jowell (9.11.2004), the First Minister of Scotland (31.10.2004), the First Minister of the Welsh Assembly Government (29.10.2004), the London Borough of Newham (24.9.2004), Essex County Council (20.9.2004) and the British Olympic Association (18.10.2004). CCAL wrote to Tessa Jowell, as Minister for the Olympics and London, in a letter dated 17 January 2008 urging the Government to commit on behalf of itself and the whole Olympic Family in the UK to ensure that London 2012 will, at an absolute minimum, comply sustainably and fully with the letter and spirit of all applicable UK and EU air quality laws and the Host City Contract for London 2012. With road transport at the heart of all exceedances of NO2 and PM10 standards in London, CCAL wrote to the Department for Transport (DfT) asking 15 crucial questions. Note also that the DfT has joint responsibility with Defra for the UK complying with air quality laws. The DfT’s reply and an additional response received from them are published in full with this news release on CCAL’s website at https://cleanair.london/. 1. Why is the DfT not taking action actively and substantially to discourage the driving of diesel engine vehicles in London instead of passing the buck to Transport for London and the Treasury? CCAL had highlighted a Written Answer by Minister of State Stephen Ladyman on 25 June 2007 which showed that diesel engines for passenger cars produce 16.9 times more particulate matter and over 83% more nitrogen oxides than the petrol equivalents (with 4.3 % less carbon dioxide). 5. Why does the DfT not have a strategy for the abatement of NOx and PM from all forms of road vehicles e.g. by setting national standards for the abatement of emissions of nitrogen oxides from older vehicles and more generally to avoid the position whereby it can be more difficult to fit one form of abatement after another form has been fitted or large vehicles are adding inconsistently one type and small vehicles another type? CCAL urges the DfT and others to insist that all advertising for new vehicles includes, along with those for CO2, performance figures for nitrogen oxides and particulate matter. This simple change would allow concerned buyers to see the full extent of pollution from diesel engines and to choose less polluting models. It would also address the misleading impression created by so-called “clean diesel”. In CCAL’s considered view, there is much muddled thinking about the transport problems facing London. Congestion and poor air quality are two serious problems but they are deeply interlinked. For example, most vehicles produce about half the carbon dioxide, particulate matter and nitrogen oxides at 20 mph as they do at much lower speeds. 4. Accelerating a modal shift to public transport, cycling and walking; and Tackling assertively other current and future sources of air pollution: these include the increasing use of non-sustainable biomass, the risks from decentralised power generation and the increasing frequency of festival bonfires of all sorts. It is particularly important that measures are not introduced that would have a small benefit for climate change but a major disbenefit for air quality (or vice versa). Londoners need to know now what will be required of them so that they can plan ahead and thereby minimise cost and disruption. Simon Birkett, Principal Contact, can be contacted via the BBC Action Network or the email or mobile telephone number provided separately. What is the DfT doing to ensure the UK meets EU Air Quality Limit Values? Thank you for your letter of the 24th of October, in which you asked 15 crucial questions of the Department for Transport – these are answered below. As the two primary questions are encapsulated in the first two specific ones, I have responded to these with a combined answer. 1. What is the Department for Transport (DfT) doing now and planning to introduce as specific measures to ensure that the United Kingdom (UK) achieves the European Union’s (EU) Limit Values for air quality throughout London given that road transport, particularly in so-called “hotspot areas”, is the biggest single cause of exceedances? The recent ‘Air Quality Strategy for England, Scotland, Wales and Northern Ireland’1, published in July 2007 by the Department for Environment, Food and Rural Affairs (Defra), highlights current DfT policies for tackling air pollution, as well as recommending new measures for consideration. 2. By what date does the DfT consider currently that each of these binding EU legal obligations for air quality will be met for each of the regulated air pollutants? Defra’s ‘Air Quality Strategy’ lists the target dates for meeting EU obligations. It also receives and processes the vast majority of air quality data. We can provide no further information on this matter above and beyond that which you received in your recent Freedom of Information response from Defra. 3. Is my understanding correct that the DfT is jointly responsible with the Department of Environment, Food and Rural Affairs (Defra) for the UK meeting its legal obligations in respect of the EU Limit Values for air quality? Assuming this belief is correct, will the DfT please make this responsibility explicit on its website e.g. in its aims and objectives, its organisation chart and elsewhere? 4. Will the DfT confirm please that it is treating air quality in its highest category of Ministerial level issues given that the UK is in breach of EU Legal Limits for air quality and now faces the possibility of enforcement action by the European Court of Justice? As a current PSA target, air quality remains a priority issue and DfT is taking the possibility of EU action very seriously indeed. 5. Will the DfT please commit to consider air pollution holistically (i.e. air quality and climate change together) whenever it considers any air pollution related matters? The importance of considering air quality and climate change co-benefits is repeatedly highlighted in the Air Quality Strategy. Where practicable and sensible, synergistic policies beneficial to both air quality and climate change will be pursued. 6. Will the DfT please reposition urgently “Act on C02” such that it advises citizens much more appropriately about vehicle choice? For example, the US Environment Protection Agency’s “Green Vehicle Guide” gives much more relevant, sophisticated and useful advice by highlighting an “Air Pollution Score” ahead of a “Greenhouse Gas Score”. As part of the ‘Act on CO2’ campaign, ‘Best on CO2’ was launched on the 30th of July 2007 (no longer available). The rankings list the top ten cars in each class for low CO2 emissions. Given the overall aim of the campaign, the focus is therefore weighted towards CO2 emissions. However, it does include some advice on air pollutants and the important choice between petrol and diesel cars (no longer available). Defra and DfT plan to investigate the possible incorporation of air quality into the ranking tables, potentially by highlighting those cars that meet Euro 5 standards. This will be of particular importance for Euro 5 diesel cars. 7. What action specifically is the DfT taking to actively and substantially discourage the driving of diesel engined vehicles in London? Please confirm that the emissions information given by Minister of State, Dr Stephen Ladyman, in a written answer to Mr Arbuthnot about “Motor Vehicles: Exhaust Emissions” on or about 25 June 2007 was correct (it was for different vehicle types in g/km) (please refer to Column 522W of Hansard). London-specific transport measures are decided by Transport for London. DfT and its agencies have worked very closely with TfL on the Mayor’s London Low Emission Zone (LLEZ). The Government fully supports the aim of the LLEZ, which is due to come into force in February 2008. DfT has assisted by running an alternative certification process and annual testing for Heavy Goods Vehicles, and by including parts of the trunk road network in the LLEZ. Please refer to http://www.tfl.gov.uk/roadusers/lez/default.aspx for more information. We have reviewed the 2005 fleet average emissions figures provided in response to Mr Arbuthnot’s question on 25th June 2007. These appear to be correct based on the data we have from the National Atmospheric Emissions Inventory. However, as noted in the response, the vehicle emissions test data underlying these figures is several years old and includes estimated figures for the performance of more recent vehicles. The Department is in the process of updating these based on recent test data including data on the actual performance of recent vehicles. In particular, the diesel NOx figures are probably too low and the HGV CO2 figures too high on the basis of recent test data. 8. What is the DfT doing to introduce technology and testing standards for the abatement of emissions of nitrogen oxides from vehicles of all sizes with particular reference to Selective Catalytic Reduction and its use in the UK’s current vehicle fleet (i.e. not just new vehicles)? When will these measures be implemented and with what estimated impact? As regards the choices made by manufacturers and operators in the process of meeting the legislative limits on emissions of pollutants, DfT remains ‘technology neutral’. Through its Type Approval work, the Vehicle Certification Agency (VCA) ensures that all new models of cars coming onto our roads meet EU emissions standards. As regards the whole UK fleet, almost all types of vehicles must go through an emission check as part of the annual MOT testing procedures. In-service testing is one of several measures designed to reduce pollution from vehicle emissions. The MOT tests are kept under review in response to developments in vehicle technology to ensure an appropriate framework. 9. Why did the DfT “scrap” recently the only DfT programme that seemed to incentivise actively the adoption of alternatively fuelled, low emission, vehicles? Low Carbon Bus Programme – to provide grants to bus operators for purchasing low carbon buses. Low Carbon Vehicle Programme – grants to encourage the purchase of low carbon cars and car-derived vans. Air Quality Retrofit Programme – grants for fitting conversions and exhaust systems to existing vehicles. Air Quality Vehicle Programme – purchase grants based on air quality standards at EEV levels for new buses and trucks. For the four programmes, analysis showed poor value for money – the costs outweighed the benefits in terms of carbon or air pollutant emissions saved. This would not have been a good use of taxpayers’ money. The ‘Low Carbon Vehicle Programme’ could only fund 0.36% of the new car market. The ‘Low Carbon Bus Programme’ could only fund around 1% of the new bus market. Air quality programmes could fund less than 1% of the market. This would not have brought about significant market transformation. The Air Quality Strategy published in July 2007 identified increased uptake of low emission vehicles as a potentially cost-beneficial measure, although a full impact assessment of the implementation options is yet to be undertaken. 10. Will the DfT commit to rebalancing and modifying fuel tax so that it treats air pollution emissions holistically rather than favouring diesel fuel as currently (with its slightly lower CO2 emissions but its much higher emissions of the hazardous air pollutants)? DfT is not responsible for the setting of duty rates for fuel, as this is a matter for the Chancellor. This question therefore needs to be directed to HM Treasury. They can be contacted at the following address: [email protected] . 11. Will the DfT commit to rebalancing and modifying Vehicle Excise Duty (VED) banding so that it treats air pollution emissions holistically instead of unbalancing the incentives in favour of diesel engines? Again, although the Driver and Vehicle Licensing Agency (DVLA) are responsible for the collection of VED, any modification of the banding is a Treasury matter. 12. What information does the DfT hold about air pollution emissions per kilometre for different types of motorcycles? 13. What action is the DfT taking to ensure that the use of biofuels in the UK is sustainable and takes full account of the need to meet air quality legal obligations? The UK Government is aware of the concerns that some biofuels might come from unsustainable sources, such as where rainforests have been cleared to grow energy crops. To address this, the Renewable Transport Fuel Obligation (RTFO) Order 2007 includes a reporting requirement from Day One, under which any transport fuel supplier wishing to claim an RTF certificate in respect of any biofuel must submit a report detailing its environmental impacts. It is expected that companies will report both on a monthly and annual basis and that the reports will include information such as the carbon intensity of the biofuel, origin of the feedstock, any environmental or social standards in operation during the cultivation of the feedstock, and changes in the land-use. In addition annual reports will include information on a company’s activities to improve data capture or activities to improve the sustainability of the fuels they source. The Renewable Fuels Agency, as Administrator of the scheme, will publish reports comparing the performance of different suppliers and the biofuels they have supplied, and it is expected that this ‘league table’ effect will encourage better performance. No significant adverse impact on regulated air quality emissions was detected for 10% ethanol blends or 5% biodiesel blends. Increases in acetaldehyde emissions were detected on some vehicles when using 10% ethanol fuel. Although not a regulated pollutant, this is of potential concern as an ozone precursor. The Department has therefore pushed, in on-going negotiations on the EU Fuel Quality Directive, for the European Commission to conduct a review of the air quality impacts before proposing further increases in the permissible ethanol content of petrol. In these same negotiations, we are opposing any relaxation in petrol summer vapour pressure limits for fuel containing ethanol, in order to prevent increases in evaporative hydrocarbon emissions. 14. What incentives is the DfT proposing to encourage the early adoption of the much cleaner Euro 4/IV and Euro 5/V engines in London and to scrap the oldest, most polluting, vehicles when Defra’s new National Air Quality Strategy made clear that transport related measures offer exceptionally favourable benefit to cost ratios? The Air Quality Strategy suggested three new measures that could, if implemented, generate significant net benefits. That is not to say that all transport-related measures offer favourable benefit-to-cost ratios. 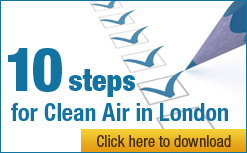 DfT recognize the crucial role that tighter Euro standards play in improving air quality. As such, we are extending the Reduced Pollution Certificate scheme to offer reduced road tax to Heavy Goods Vehicles and buses meeting the Euro V standards ahead of the date that this becomes mandatory (1 October 2009). Please refer to http://www.transportoffice.gov.uk/crt/vehicleowners/vehicletests/specialisttests/environmenta lvedtest/rpcsforearlycomplianteuro5andeevvehicleswithnoxcontrol.htm. Euro 4 and IV standards are already mandatory. For information on specific London measures, please contact Transport for London (contact address as previously stated). 15. What specific action is the DfT taking to assist London to introduce urgently dynamic road pricing (“tag and beacon” or the equivalent) to replace in full the current “blunt instrument” of congestion charging? What more needs to be done to implement this mechanism quickly across London? This is again a matter for TfL. Once again, thank you for your letter. I trust that these answers will be of use to you. How can the DfT consider it is making reasonable efforts to meet EU legal limits for air quality throughout the UK (indeed to take “very seriously” the threat of EU legal action) when the only criteria it seems to use for assessing measures to mitigate air quality exceedances are “cost benefit ratios”? Thank you for your e-mail of November 22nd, in which you asked the above question. New and existing measures to mitigate air pollution are assessed against a variety of criteria. Clearly, measures that are ‘cost-beneficial’ are preferable, as they offer both the desired improvements and value for money. As you rightly point out, though, the UK has a legal obligation to achieve EU targets for key pollutants. This is an obligation that we take very seriously. For this reason, if further measures are required above and beyond ‘cost-beneficial’ ones, we would consider those that are most ‘cost-effective’. I trust that this answers your question. Once again, thank you for your message.